Mexico continues to remain a strategically competitive geographic location for North American businesses seeking a cost-effective, high quality manufacturing and assembly solution for product production. From the standpoint of an electronics manufacturing services provider like Milwaukee Electronics, our focus generally centers on printed circuit board assembly, electronics manufacturing, and the placement/assembly of PCB components. However in our Tecate, Mexico facility electronic product assembly represents only part of Milwaukee Electronics’ activities. “We have a coordinated structure of specialized work cells within the Tecate manufacturing facility capable of supporting system integration and box build product assembly. For customers requiring support for mechanical product assembly, we also have strong mechanical and electromechanical manufacturing capabilities. The Tecate, Mexico location has proven to be an excellent solution to customers looking for a range of product box build services beyond initial circuit board assembly .” said Pirouz Pourhashemi, General Manager of the Tecate facility. “Customers are finding we have significant expertise in manufacturing engineering, quality management and workforce training infrastructure in Tecate,” Pourhashemi added. 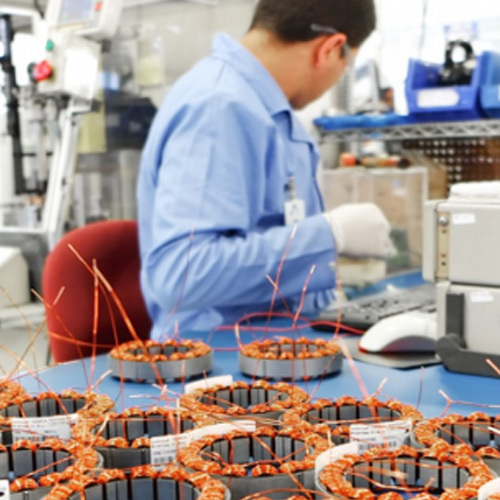 For example, the Milwaukee Electronics Tecate location currently utilizes groups of specialized work cells to assemble a variety of small motors, controllers, and solder termination shields used in aerospace products. Traceability data for components used in assembly operations are transmitted directly to the customer. Although most work cell projects utilize specialized fixtures and automation equipment which are project-specific, other generic processes such as conformal coating or Checksum testing equipment can be synergized between cells. “The Tecate, Mexico facility has the ability to offer competitively priced solutions for automated circuit board production and electronic manufacturing. What’s more, for instances where a high level of labor content is required in a project, an even greater savings potential currently exists. Outsourcing teams sometimes assume that mechanical assembly projects in Mexico would be difficult to bid or that they wouldn’t be of interest to electronic manufacturers like Milwaukee Electronics, but this is not the case. The fact is our pricing model is arranged to easily accommodate bidding on mechanical assembly projects. Customers are capitalizing on our full service facility with world class infrastructure, shared-border logistical simplicity, and the full benefits of ‘offshore’ pricing. In many cases, internal production teams are happy to discover the projects that existed outside of their production ‘sweet spot’ can now be handled in our Tecate facility, which allows them to free up valuable space on their own production floor,” said Pourhashemi.